I have previously compiled a list of free online photo collage makers which allow you to create gorgeous picture collages easily without spending a dime. In this post, I will share with you some great websites to generate photo collage for your Facebook Timeline cover photo. Before we begin, you should also check out this cool infographic about 10 surefire tips to stop wasting your time on Facebook. 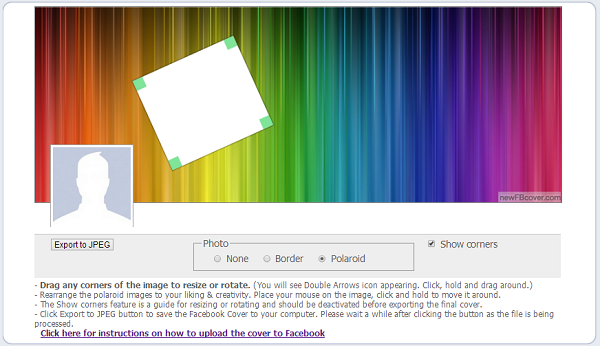 PicMonkey has 4 different layouts for Facebook cover collage, which allows you to insert 3 to 7 photos on the canvas. The layouts are not fixed, you can add even more photos by dragging and dropping them between the existing slots. Resize, rotate, flip, or adjust exposure of uploaded photos if you want. Also, you can adjust the spacing between photos, corner rounding, and background color/transparency. You can find some free swatches by selecting the third tab on the left sidebar, which may be useful for decorating your cover photo. After completion, you can send the collage to PicMonkey’s Editor to add text, frame, texture, effects, overlays, and more, by selecting “Edit” at the top menu. Generating a timeline collage with Pic Scatter is amazingly easy. Pic Scatter will automatically create a cover collage based on the photos of your Facebook friends, Facebook likes, or photo album. For example, if you wish to create a cover photo collage based on your Facebook friends, simple select Facebook friends as your photo source and Pic Scatter will populate the canvas with their current profile pictures. Then, add any filters that you like. PosterFuse has an intuitive and user-friendly interface that makes generating a cover collage so much easier and enjoyable. Sign in with your Facebook/Instagram account or upload your own photos to start adding photos on the canvas. You can crop, add effects, enhance, and rotate your uploaded photos before inserting them on the canvas by drag and drop. Then, you can download the completed Facebook cover to your PC or upload to your Facebook/Instagram account. The only drawback is the generated cover has PosterFuse watermark on it. 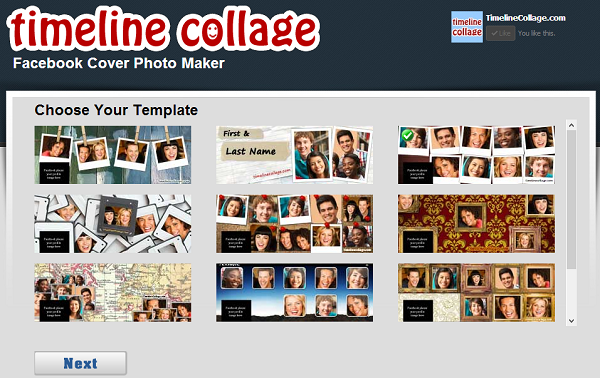 Timeline Collage has 11 free templates, but you must like their Facebook fan page to use 8 of their 11 free templates. 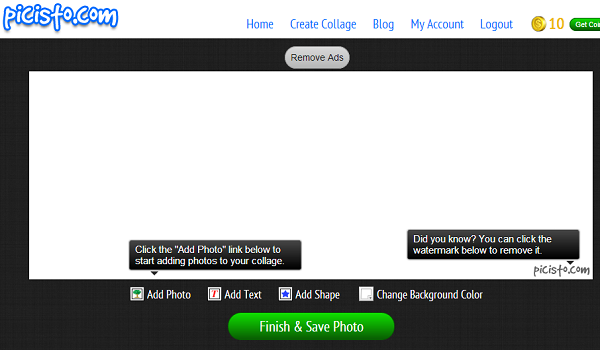 After selecting your template, you will be asked to choose your Facebook friends to be included in the collage. It will then extract your chosen Facebook friends’ photos and you just have to select which photo that you wish to insert into the selected template. Timeline Collage is similar to Pic Scatter, but Timeline Collage allows you to select photos other than your friend’s current profile picture. piZap provides 13 different layouts for Facebook cover collage, which are able to fit up to 12 photos in a collage. After choosing a layout, you can add photos, stickers, text, cut out/face, frame, and more. piZap too offers some photo editing features such as rotate, resize, flip, adjust color, auto-fix, effects, filters, etc. A solid collage tool in overall. 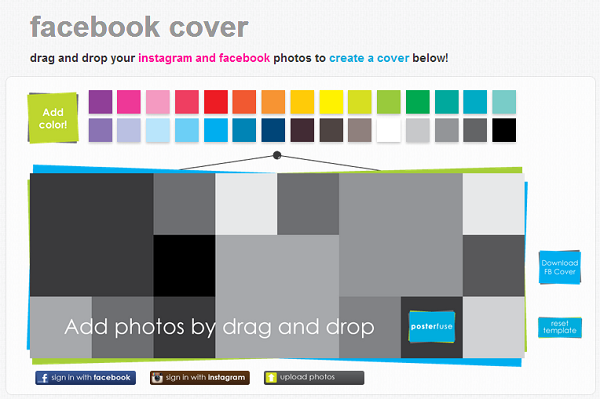 newFbCover has more than 20 free cover backgrounds available for you to choose. Simply upload photos from your computer and place them on your chosen background. You can also resize, rotate, add borders, add Polaroid effects, or show corners on your photos. Once you have completed, click “Export to JPEG” to download the cover collage. 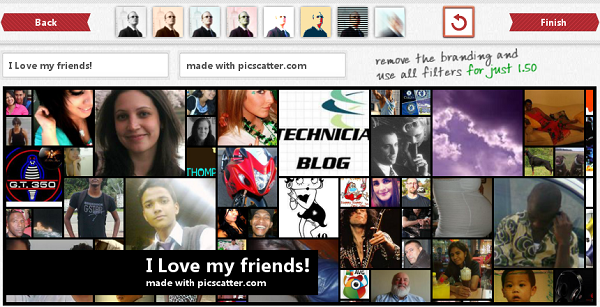 Picisto allows you to create Facebook timeline cover collage, but with very limited and basic features. You can add photos, resize, or re-position it on the canvas, add simple text with colors and/or shadow, add shapes, and change background color. That’s it. Nothing complicated or fancy, so don’t expect to be able to generate a stunning or professional looking Facebook cover with this simple tool alone. At least one of these links are to sites that no longer exist. Could you do an update on this article?